The Pineta Club Hotel in Marmaris was built with family holidays in mind. This 3 star hotel has an abundance of family friendly activities and facilities for all ages and tastes. When it comes to swimming and sunbathing, you have got the choice of three pools. There is a large freeform pool and an activity pool outdoors and a heated number under cover. Mum and Dad can chill out in the sunshine or head indoors for a relaxing massage or an invigorating Turkish bath. The children get a look in too with their own mini club, play areas, pool, entertainment and fun activities to join in. If sandcastles or water sports are on your holiday list, you are in luck! The sandy beach is just a short walk away. As for dining, the main restaurant is a buffet affair serving up flavours from around the world. Whether you only want a snack, a sandwich or afternoon tea and cakes, there will be something to tickle your fancy onsite. When the sun goes down, enjoy a drink in one of the bars or take a relaxing walk into the centre of Marmaris. Discover why the Pineta Club Hotel is a great value place to stay in Turkey. 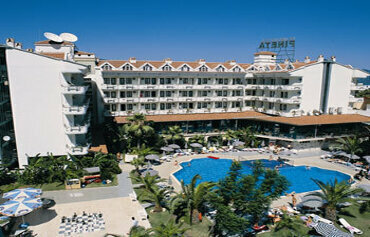 The Pineta Club Hotel has all the facilities you would expect from a 3 star hotel in Marmaris. Highlights include: Two outdoor swimming pools, sun terraces and sun beds, an indoor pool, restaurant, cafe bar patisserie, three bars, 24 hour reception, internet corner, currency exchange, doctor and minimarket. On the sports front, you will find water gym, basketball, tennis, carpet football pitch, darts, table tennis and chess. Beauty and health facilities include a Turkish bath, sauna, solarium (horizontal and vertical), Jacuzzi, massage room, fitness and health centre, beauty salon, men and womens hairdresser. The children have access to a mini club, play garden, two playgrounds, mini golf, kids pool, kids animation activities and babysitter. 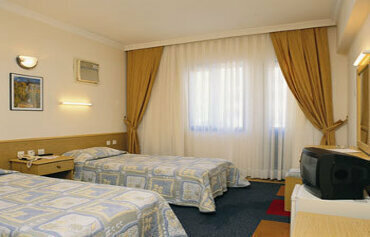 The hotel has 501 guest rooms including double, single, twin and suite rooms. All rooms have a TV and mini bar, split air conditioner, direct dial telephone, safe, hairdryer, shower cubicle, carpet floor and balcony. Some bathrooms also have a bath and there are five rooms adapted for disabled people. When it comes to restaurants and bars, you will be spoilt for choice. The Tuana Restaurant offers a buffet service and seating for 1000 people. The Pineta Cafe Bar Patisserie is perfect for morning coffee or afternoon tea and cakes. There is also the Terrace, Garden Pine and Frequency Bars for refreshing alcoholic and soft drinks. 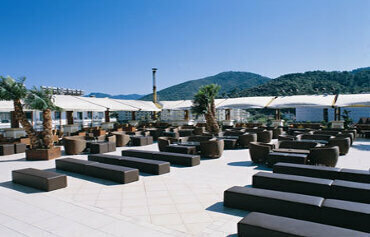 The Pineta Club Hotel is situated in Marmaris, just 2kms from the city centre and approx 500m from the beach. Dalaman Airport is approx 90kms from the hotel.